Classical WETA 90.9 FM Washington, DC live stream. They go bananas at Christmastime lol. The facial scanner is made by China Electronics Technology Group (CETC), a state-owned defense contractor that has spearheaded China’s fast-growing field of predictive policing with Xinjiang as its test bed. The [Associated Press] AP found 27 CETC bids for Xinjiang government contracts, including one soliciting a facial recognition system for facilities and centers in Hotan Prefecture. The government’s tracking efforts have extended to vehicles, genes, and even voices. In February, authorities in Xinjiang’s Bayingol prefecture, which includes Korla, required every car to install GPS trackers for real-time monitoring. And since late last year, Xinjiang authorities have required health checks to collect the population’s DNA samples. In May, a regional police official told the AP that Xinjiang had purchased $8.7 million in DNA scanners — enough to analyze several million samples a year. In one year, Kashgar Prefecture, which has a population of 4 million, has carried out mandatory checks for practically its entire population, said Yang Yanfeng, deputy director of Kashgar’s propaganda department. She characterized the checkups as a public health success story, not a security measure. The document’s full text remains secret, but the AP found at least three contracts referring to the 2016 directive in recent purchase orders for equipment such as microphones and voice analyzers. Meiya Pico, a security and surveillance company, has won 11 bids in the last six months alone from local Xinjiang jurisdictions. It won a joint bid with a DNA analysis company for 4 million yuan ($600,000) in Kargilik and has sold software that automatically scans smartphones for “terror-related pictures and videos” to Yarkent. Meiya and CETC declined comment. Lots more of importance in the AP exclusive report, and kudos to AP for getting the story. One question not addressed in the report would be whether China's government is selling high-tech surveillance equipment and teaching surveillance techniques to other authoritarian governments. Another question is whether any supposed liberal democratic governments are also abusing technology to institute a police state that would have been the envy of the East German secret police. On Friday America's CNN further cemented its reputation as a purveyor of fake news by reporting that sources revealed to them that President Donald Trump had advance knowledge of a Wikileaks leak, thereby finally proving once and for all that he was in collusion with the Russian government (on the unproven claim that Wikipedia is connected with the Russians). The problem for CNN is that they and/or their sources got the date wrong; by the time Trump was allegedly informed of the Wikileaks leak it had already been in the public domain for about 24 hours. As to where the CNN fact-checkers were -- the unanswered question has led cynics to speculate that CNN, in their zeal to nail Trump for collusion with the Kremlin, simply lied to the public or refrained from even basic checking on what the sources told them. To cut a time-wasting story, CNN's report was just the latest in a long list of fake news promoted by American media and their buddies in Washington, who live to see Russia balkanized and Trump kicked out of the Oval Office for suggesting he wanted to cooperate with Vladimir Putin on certain national security issues. By the time Rush moved to another topic, even obtuse listeners could have surmised that Trump has been the target of a disinformation campaign so massive it's hard to comprehend how his enemies got away with telling so many whoppers -- hard, unless one has watched the machinations of the Get Russia crowd for years. At the least he should consider Russiagate before he again orders missiles lobbed at a Syrian military airbase to punish the Syrian government for a chemical attack they had nothing to do with, or while he's uncritically accepting horror stories about Syria's President Bashar al-Assad that have no basis in fact. I worked for CBS for 18 years so I knew how they fact-checked reports; they were fastidious. They didn't want to get facts wrong. The carefulness is gone now in the US news media. Replaced by 'confirmation bias.' [i.e., one interprets information to fit one's preconceived beliefs.] This has rendered the mainstream media an unreliable source for news but has spread across the entire US media. Now a national crisis of the media generally, not just the MSM. Now seeing the criminalization of contacts (including diplomatic) with Russia [ostensibly because of US national security policy]. I've realized the large role that the MSM (NYT, Washington Post, CNN, MSNBC) played in creating Russiagate. Stories that Trump was a Manchurian Candidate or Putin puppet were developed in first half of 2016. In December (2016) Obama put sanctions on Russia for Russiagate, not Syria or Ukraine. US State Department has been the laughing stock of the world for years. Lots more in the discussion, which John Batchelor titled "As Russiagate crumbles, Russia strengthens," but which is as much about the crumbling of the American news media. "Progressive [Pakistani] historians — admittedly in the minority still — are trying to educate Pakistani students about their country’s ancient history and religions, after years of being told that Pakistan’s history begins only with the invasion of Sindh by the Arab conqueror Muhammed bin Qasim in A.D. 711." The quote is from a New York Times report on the popularity of Yoga in Pakistan (see below). Some readers might wonder how any Pakistanis could believe their history only started in 711. Easily, if a majority of the population is illiterate/functionally illiterate; lives in isolated areas in a country where the media, including internet, is heavily censored; and is conditioned to accept the version of history impressed on them by their government-sponsored religious preceptors. But it's getting harder in this era for governments to get the public to believe big lies -- something that's true worldwide, not only in 'developing' countries such as Pakistan. Does this mean Pakistan could be heading for its most dangerous era, as the 'old guard' tries to quash 'progressives?' Pakistan has already reached that point, and because of this things will get worse in the country before they get better. KARACHI, Pakistan — I first heard of yoga while I was growing up in Pakistan in the 1980s, with the arrival on the Karachi scene of a colorful personality called Professor Moiz Hussain. He had trained at the Yoga Institute in Mumbai, then branched out into alternative stress-reduction and healing techniques like reiki from Japan, NLP (neurolinguistic programming) from California and qigong, with roots in China. His Institute of Mind Sciences and Classical Yoga attracted a certain type of Karachi woman — affluent and well traveled — who was interested in developing her mind and body. Slowly at first, one teacher after another emerged to offer classes. Still, they had to be careful: The 1980s was a time of rigorous Islamization in Pakistan and cold hostility to India, and anything remotely associated with India or Hinduism was discouraged if not outlawed. This particularly affected the arts, namely classical Indian dance; government officials banned public performances as both “vulgar” and “Indian”; Pakistani students of the art could not obtain visas to study under gurus in India, and local teachers had to immigrate to other countries because classical dance became so unpopular they could not attract students. The way around this was to introduce yoga as a practice less spiritual than physical, but yoga classes in Karachi remained small, private and for a select few. Then, in the 1990s, when state-run television gave way to a profusion of private television channels, yoga found another outlet: breakfast and morning shows in which a physical activity segment aimed at housewives often included a 20-minute or half-hour yoga session. Sandwiched in between advice on the best foods for a baby and how to cook enticing meals for the household, a nonthreatening form of yoga — no extreme physical poses, just one that could be performed in modest clothing — was available to women in Pakistan with access to cable channels. Viewers were encouraged to stretch and breathe to cultivate healthy bodies and minds, a goal not incompatible with the moderately conservative form of Islam practiced by 90 percent of Pakistanis. Yoga even began to come out into the open, with sessions held in public parks, where some teachers made mild comparisons between yogic meditation and Islamic reflection, or the poses in the simple sun salutation and the positions taken in salat, a ritual Islamic prayer. This opened up yoga to middle-class, conservative Pakistanis who might have remained hostile to the practice had it been presented as a purely Hindu or Indian ascetic discipline. Today, yoga is immensely popular in all cities of Pakistan; a yoga teacher named Shamshad Haider claims to run 50 yoga clubs in Punjab, and International Yoga Day has been celebrated in Pakistan for three years in a row. 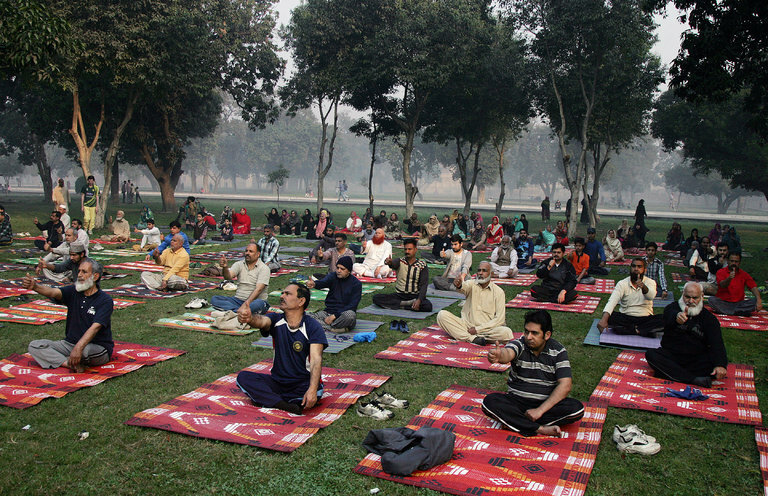 Yoga is practiced all the way from Chitral in the north to Karachi in the south. There’s a whole crop of younger teachers now equipped with training from India, Thailand and Bali, as well as from yoga schools in North America and Britain. Teachers at swank studios in Karachi attract students through Facebook pages and affiliations with the International Yoga Alliance. Their classes incorporate styles from hatha, vinyasa flow, ashtanga, even power yoga and Bikram yoga. They use the Sanskrit names for the poses interchangeably with the English ones, and both women-only and mixed classes are popular. Meanwhile, yoga still appears on television, in schools and in park sessions, with women meditating while wearing shalwar kameezes, or full abayas and hijabs, and men with long beards and shalwar kameezes performing sun salutations next to men in track pants and T-shirts. Yoga purists would probably bristle at the attempt to dissociate yoga from Hinduism or India, but it’s not that different from what’s happening to yoga in the West, with its hot yoga studios and aerial yoga and Yoga Asana championships. It also reminds me of what has been happening to Sufism, the mystical branch of Islam. In the West, Sufism has been disconnected from its Muslim roots and presented as a universal movement of peace and tolerance, the 13th-century Persian mystic Rumi portrayed as a lovelorn poet singing of love rather than a conservative Islamic cleric bent on forging a fierce connection with his creator. A necessary sacrifice, perhaps, to spread the universal message of peace, tolerance and love. Pakistan, which was amputated from India in 1947, then lured by the promise of power and richness coming from the Middle East, has never been able to decide whether its identity is Arab or South Asian. After decades of trying to identify with a purely Islamic heritage and history, some Pakistanis are finally recognizing that their heritage is unique, informed by strains of tradition and heritage from many geographical areas: Central Asia and Persia, as well as India and the Middle East. Our current challenge is to reconnect with the many sources of our roots and heritage, while forging a new identity that will serve us well into the future. Pakistan recently unveiled a 1,700-year-old sleeping Buddha statue from an ancient Buddhist site in Bhamala, one of many that dot Pakistan’s north and northwest — a strong testament to its pre-Islamic heritage. Progressive historians — admittedly in the minority still — are trying to educate Pakistani students about their country’s ancient history and religions, after years of being told that Pakistan’s history begins only with the invasion of Sindh by the Arab conqueror Muhammed bin Qasim in A.D. 711. As I practice yoga in the crisp air of a mild Karachi winter, gazing out to the Arabian Sea, I can’t help wondering whether some of this reconnection might come from yoga. We move in unison as our teacher calls out the Sanskrit names of the poses called asanas. Then the call to prayer begins to ring out from a nearby mosque and we fall silent, listening to the sound of our own breaths and the time-old Arabic words of the azaan. As soon as the practice is over, I’ll roll up my yoga mat and go find my prayer mat. I’ve never felt so integrated, so connected to my Islamic heritage and my South Asian roots. One day an American named Paul Salopek left his work as a war correspondent and began walking. What came from that was an amazing journey on foot. Dubbed the "Out of Eden Walk," it's a seven-year walk along one of the routes taken by early humans to migrate out of Africa, a transcontinental foot journey that will cover more than 20,000 miles. Along the way, Salopek reports on what he sees for a variety of publications and shares video of places and peoples few even know about. His walk is funded by National Geographic Magazine, the Knight Foundation and the Abundance Foundation. The foot trek hardly circumscribes his life, full of adventures bound to fascinate the young and young at heart. There's just no way to describe Paul Salopek's life in a few words -- for example he's worked as a commercial fisherman; in 1998 he won a Pulitzer Prize for explanatory reporting on the human genome project; in 2001 he won another Pulitzer for reporting on Africa; in 2006 found himself ambushed and imprisoned in Darfur -- but a start is Wikipedia's article about him. And there's a recent six minute interview for PBS NewsHour about the present part of his journey, which has taken him through regions in Afghanistan where the people are completely untouched by terrorism and war, and into Pakistan. There is a transcript for the interview at the PBS site, but the video discussion is against the backdrop of stunningly beautiful terrains and people he's met in those remote parts, and features a map of his route. I see from comparing a photograph at Google taken when he was younger -- he's now 55 -- and the video interview at PBS that his adventurous walk across the world has turned his hair grey. I'd say the grey hairs were worth it, and I think he would agree. The Egyptian government and its military have been tight-lipped about details of the attack at Al Rawdah mosque in Northern Sinai on November 24, so reporters have had to rely greatly on eyewitnesses among the survivors. Inevitably, as in any 'fog of war' situation, this has meant conflicting accounts about certain aspects of the attack; e.g., the number of attackers and number and type of vehicles they arrived in, whether a suicide bomber was used, and the number and type of explosions in/around the mosque. (One survivor thought at first he was hearing explosions then realized it was barrages of machine gun fire). Ahmed Ghanem al-Jarirat, a resident of the village, said that the attack went on for 25 minutes during which the perpetrators pursued people trying to flee while making sure the victims were in fact dead. “The gunmen followed most of those who fled the mosque in the empty area surrounding it and shot each and every one of those who fell to the ground with a bullet in the head who they doubted was dead. This took 25 minutes,” he said. “After the terrorists had killed the worshipers, they went to the cars belonging to them in front of the mosque and set them on fire, after pouring gasoline on them. We called the ambulance which arrived within minutes after the gunmen had left the mosque,” he went on to say. He pointed out that the attackers opened fire on the arriving ambulance while fleeing when the army approached. “The gunmen were hiding and fired at it directly. We saw blood coming from the paramedics. As soon as the gunmen felt the army approaching, they fled to the south,” Jarirat said. In short, at least two credible news sources spoke with eyewitnesses whose description of the attackers' thoroughness dovetailed. Given that the initial 'scattershot' phase of the attack had struck at least 400 in the mosque area and that there were only between 25-40 attackers (with most accounts putting the number between 25-30), the effort to examine and kill everyone among the victims would have taken considerable time -- 25 minutes by Jarirat's reckoning. This meant the attackers took a big risk that security forces would arrive before they decamped, especially because they knew a military base was not far from the village. And if a suicide bomber wasn't used in the attack (most accounts make no mention of such), then the attackers definitely didn't want to lose any operatives during the assault -- and they would have known their best bet in this would have been to finish the attack as quickly as possible. I don't know whether fighter jets and helicopters were at the nearby military base but even with one helicopter there, the attackers would have known their escape route could be quickly tracked from the air. Yet they took the time to ensure those wounded/felled in the gunfire were actually dead. This is extraordinary; indeed it's unprecedented in all accounts of terrorist attacks, worldwide, I can recall. And certainly it's unprecedented for all 'jihadi' style terrorist attacks, of the kind made famous by al Qaeda and its offshoots including Islamic State. So there you have it: a sophisticated, flawlessly executed attack on a mosque that was guaranteed to be packed to capacity on that particular day (the Friday closest to the start of 2017 birthday celebrations for the Prophet Muhammad), with most of the women out the way at the time of the attack, which launched at the start of the sermon. One account has it that the mosque can hold 500 people, another that its capacity is 400. So when we consider that 311 attendees were killed, with about 216 wounded, the attackers shot just about everyone present in the mosque and its close environs (a plaza just outside the mosque). And while 27 (male) children were among the dead I will assume they, along with any adult females who were killed, were collateral damage. The attackers weren't interested in a random selection of victims; they were intent on shooting every adult male in the mosque and, within the time allotted for the attack, making sure wounded adult males were dead. In this, the attackers even went so far as to attempt to ward off an ambulance(s) that arrived at the mosque. So I'd say that "composed," as the AP writer put it, hardly describes the attackers' mein. Yes they were composed; surely they were chosen because they were very experienced. But if their entire mission was to execute all adult males in the mosque, they took the time to do this methodically because that's what they were ordered to do. Given all the above, and despite opinions that Sufism was the attackers' target, I think that religious beliefs were the least of the target. If the attackers had simply wanted to terrorize attendees at that particular Sufi mosque (which was open to all Muslim sects), they needn't have taken so much time and effort to do it, especially because they clearly didn't want a shoot-out with security forces. So what was the motive for such targeted killings, aside from killing Sufi males? From a report filed November 26 by Hamza Hendawi for The Associated Press, and from several other credible news reports, the local chapter of Islamic State had repeatedly warned persons associated with the Al Rawdah mosque to stop collaborating with Egyptian security forces (and of course to stop practicing Sufism). And Debkafile's first report on the Al-Rawdah massacre, posted within a few hours of the attack, stated that Al Rawdah mosque "... is frequented by Egyptian security officers posted in the region and their families." When I place the reports from The Associated Press et al. and Debkafile together, I come up with collaborators as the prime target, with Egyptian military personnel as the bonus -- or the other way around. And so all things considered, I wouldn't describe the massacre at Al Rawdah mosque as a terrorist incident; it was a mass execution by firing squad. Now as to exactly which group carried out the execution, and whether it was done at the behest of some other group or faction -- the list of suspects would be long in both cases. The answer as to whether it was a contract killing might depend on just how many Egyptian military personnel were gunned down, a number which I doubt the Egyptian government is willing to share with the public. But no matter how you look at it, the attackers killed just about every collaborator in the village of Al-Rawda. 1) Given that everyone who observes terrorist activity in the Middle East knows about Debkafile, I find it odd that no one else reporting to the public about the attack has mentioned the significant detail found in the Debkafile report. And I've not come across mention anywhere else that Al Rawdah was frequented by Egyptian security personnel -- although I could understand the Egyptian government not wanting this discussed in press reports. In Egypt suspicion has fallen on an Islamic State faction for the massacre on November 24 at the Al-Rawdah Sufi mosque in Sinai. I'll have more to post on the massacre, but here I want to focus on just one part of an Associated Press report, filed today by Hamza Hendawi with Maggie Michael, which discusses the faction. This faction is looking to me more like an emerging splinter group. Fuel for this suspicion is that Islamic State uncharacteristically didn't take credit for the massacre, even though there are strong indications it was an IS-type attack at least in its kinetic details -- except for two deviations, which I'll mention in the next post. But both deviations could easily point to an IS faction. Even before the attack, Egyptian newspapers reported the emergence of the Hazimiyoun faction in Egypt. One quoted a prosecution official saying detained Egyptian IS suspects told their interrogators that they are followers of the Hazimiyoun and consider some IS leaders as infidels. The faction is named after a radical cleric, Ahmad bin Omar al-Hazimi, who has been imprisoned in his home country of Saudi Arabia since 2015. It considers as infidels — and therefore as legitimate to kill — all Muslims who do not accept the Islamic State group's interpretation of Islam. Even further, it says those who don't consider such people as infidels are also infidels deserving of death. Al-Hazimi himself is not known as an IS member but his ideology has gained support within IS ranks. But IS largely argued that Muslims in general, even if they haven't sworn allegiance to IS, are not necessarily legitimate targets, on grounds of "ignorance" — namely, that they may not have the religious knowledge to accept IS. The Hazimiyoun faction rejects the "ignorance" excuse. The feud within IS has been stoked by the group's military defeats in Iraq and Syria. Hazimiyoun clerics have blamed IS leader Abu Bakr al-Baghdadi and his "lenient" ideology for the setbacks. But the tensions date back to 2015, when IS in Syria executed a number of pro-Hazimiyoun clerics because of their excesses in declaring others infidels. The more radical free hand has been criticized by al-Qaida-linked groups and other extremists in Egypt. Another militant group fighting the government in Sinai, called Jund al-Islam, said in a recent audio message that it had ambushed an IS patrol to avenge attacks on other Muslims.